Yesterday, Don Salubayba opened his LAMAT exhibit at the Tin Aw Gallery. I was very anxious to get there, actually, since I don’t really want to be an obstruction (translation: taking photographs with wild abandon, unmindful of who’s viewing the art works). I wanted to get there before everyone else. Hehe. Well, I wasn’t the first person to arrive, but I was glad to see that Don — a 13 Artists awardee — was already there to welcome his guests. Don is one of the friendliest artists I’ve ever met and he’d always have a ready smile to greet you with. 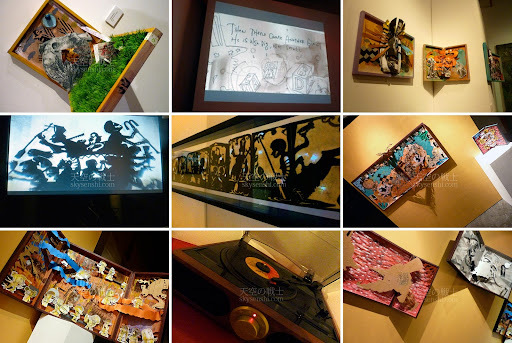 I first encountered his art when I went to the 2009 13 Artists Awards at the CCP. I have a thing for warm colors (his work was bronze) and unusual textures so I immediately took a liking to his display. It was only this year that I met him personally and I was happy to note that he is just as likable as his works. So you can imagine how excited I was to attend this exhibit that I actually left all my other colleagues, whom I thought were taking too long, and went to Tin Aw on my own. Aaaand I found yet another favorite piece, Bigbang Bamboo (mixed media on canvas). Everyone will accuse me of being biased because this one is reddish yet again — plus his mixed media are notorious for making me a bit obsessive — but I really love this one. Don’t get me wrong, LAMAT actually reflects how multifaceted Don’s talent is — some of his works are animated, some are stills, and many of them just literally pop. I just really really really really like this one. Too bad I can’t afford it. You can feel all of these in this exhibit without experiencing the visual burn-out one tends to get when bombarded with imagery. Above: The artist behind the art. Don has a lot of stories to tell and it shows in his craft. Maybe the things he doesn’t really say out loud just come out through all of these? Below is yet another work that intrigued me. I didn’t know how to frame it in my lens, because I couldn’t catch the details in their entirety. I complained about the shadows. Another artist, J Pacena II said, “I think the shadows are part of it.” I looked at it again and saw that he may be right! I’ve done my best in capturing my translation of its essence. I suppose that’s not enough. If you’re wondering about what the shadows cover, you’ll really have to go to Tin Aw and see for yourselves. Waking up and realizing you’re fat.